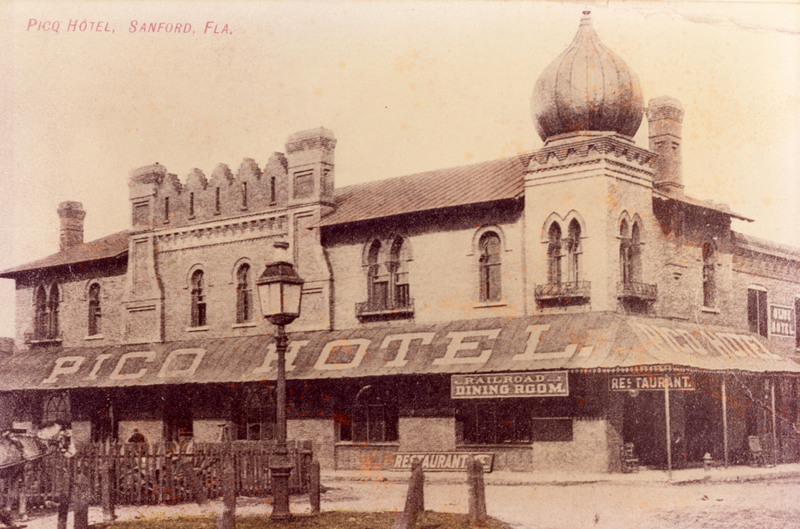 Sanford's PICO Hotel, located at 209 North Oak Avenue, was built in 1887 for Henry B. Plant, President of the Plant Investment Company or (PICO). The onion-shaped dome located on the southwest corner of the roof resembled a Turkish minaret. The dome was destroyed by a severe thunderstorm in the 1950s and was never replaced. The PICO Hotel served as the terminal hotel for a railroad and two steamship lines owned by Henry Plant. President Calvin Coolidge spent the night at the PICO Hotel during his visit to Sanford. Print reproduction of original black and white postcard: Photographic Collection, box 3, folder Businesses--Hotels, General Collection, UCF Public History Center, Sanford, Florida. Original black and white postcard. Digital reproduction of print reproduction of original black and white postcard. Photographic Collection, box 3, folder Businesses--Hotels, General Collection, UCF Public History Center, Sanford, Florida. 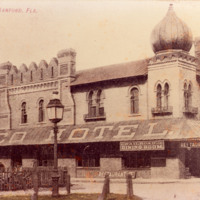 "Pico Hotel, Restaurant, and Stores - 1887"
“PICO Hotel Postcard.” RICHES of Central Florida accessed April 21, 2019, https://richesmi.cah.ucf.edu/omeka/items/show/862.